Here we are! Welcome to October and the OctPoWriMo Poetry writing challenge 2013. Fall is my favorite season. The air is crisp and cool, the leaves are changing to gorgeous hues, crunching beneath our feet and there seems to be a quiet in the air. For the first writing prompt, picture yourself on a park bench in the midst of a full blown Autumn day. Perhaps you're wrapped in a warm sweater, drinking hot cider - you have a notebook and pen and it's just you and your thoughts. Look around, what do you see, hear, smell? If you can actually go to a park, so much the better, although I realize it's still early in the season. But if you can just close your eyes and imagine...think about what you love about Fall...and see where it takes you with your poetry. Poets such as Blake, Keats and Shakespeare have been inspired by the season; there are so many sensory and tactile elements to Autumn that inspire the romance of poetry. 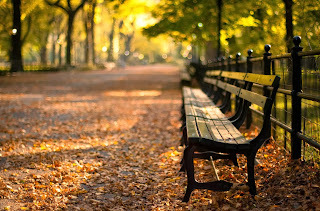 Writing Prompt: Imagine yourself in the midst of an Autumnal setting. Using prose, describe what is all around you; what you see, hear, feel, smell, touch. Tell us about the glory of the season. It need not rhyme of course, just put yourself in the setting and through your imagery, take us there too. The prompt is only a suggestion or stepping off point. If you wish, write about anything that inspires you and link it up below. I can't wait to see what everyone comes up with. We're in for an inspired and creative month! I tried to comment to many poems that I read today for the first day post but somehow facing an error when trying to post them. Loved all the poems anyways.